Apparently, I have a bit of an addiction to making Christmas wreaths. This is my third wreath of the season, and it might be my favorite one yet! 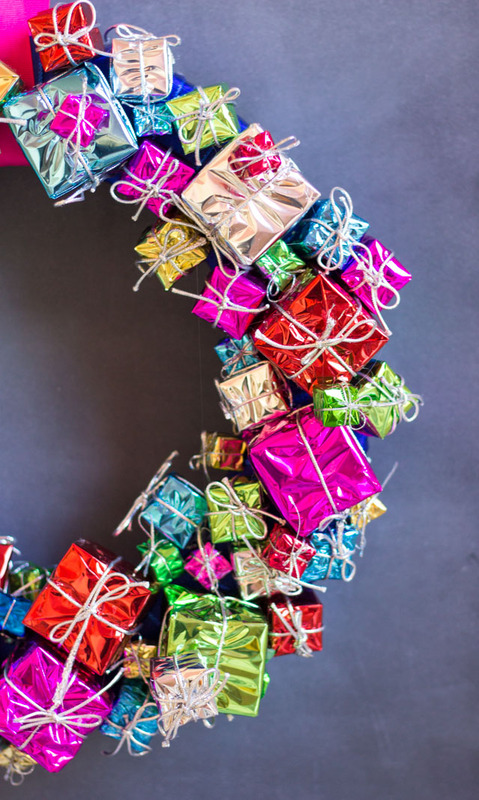 I spied these pretty little jewel toned packages all wrapped with silver bows at Hobby Lobby. 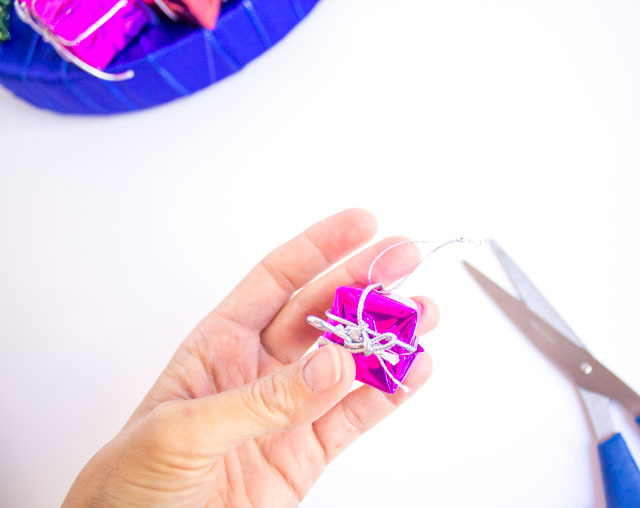 They are meant to be mini Christmas tree ornaments and come in packages of three different sizes. 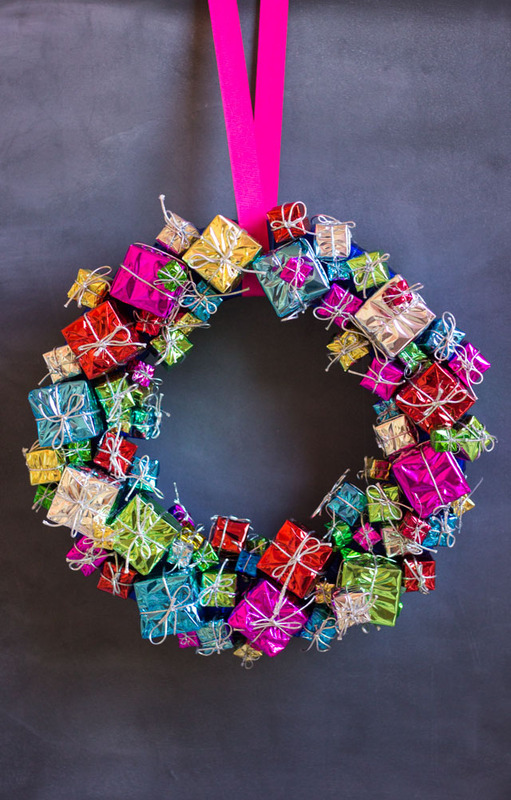 They make one eye-catching wreath when all grouped together. 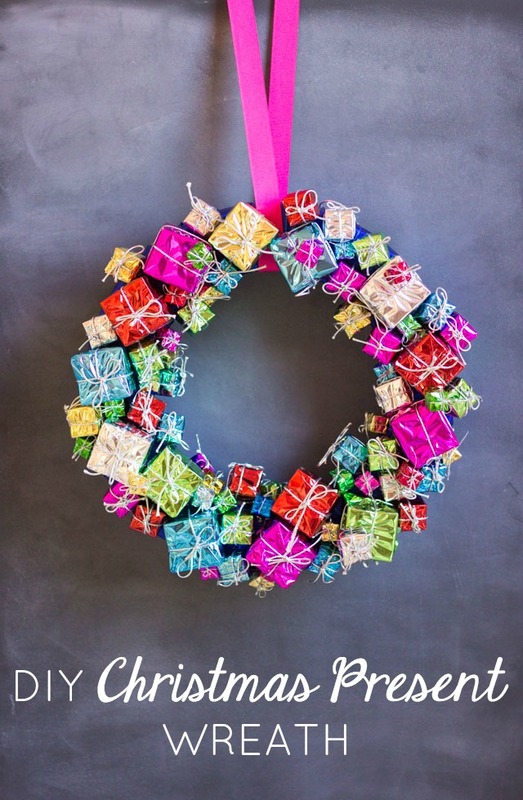 Read on to see how easy it is to make this colorful DIY Christmas present wreath, and don’t miss the pom-pom snowball wreath and mini Christmas tree wreath I also made this year! I took advantage to Hobby Lobby’s 50% off Christmas decor sale to buy these gift box ornaments for about $12 total. You can find these in their aisle dedicated to mini Christmas tree ornaments. I bought two packages of the largest presents, one package of medium, and one package of small. I purchased the wreath form with my 40% off coupon and the entire wreath cost under $20 to make! 1. 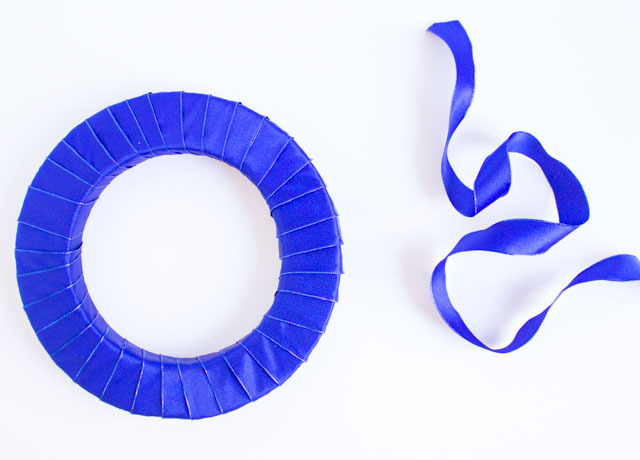 Wrap foam wreath form with ribbon, overlapping slightly as you go. 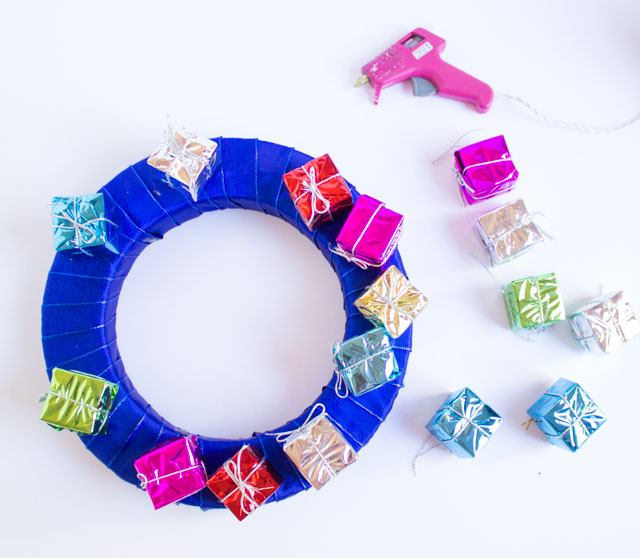 Once you’ve covered all the wreath form, secure the end with hot glue. 2. 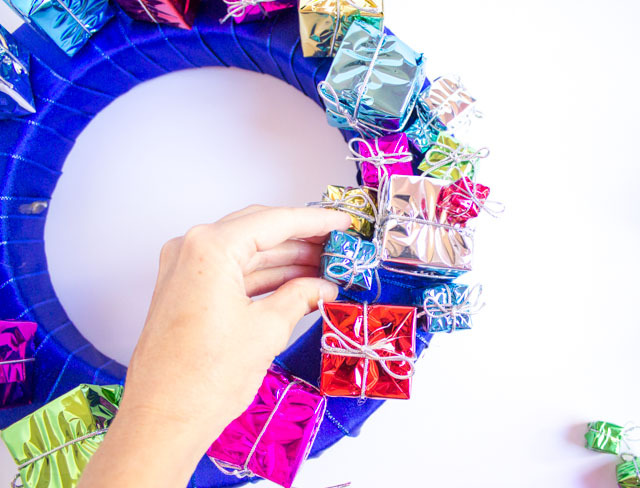 Add the present ornaments to the wreath by first trimming off the ornament hanger with a pair of scissors.You can also use the scissors to trim the bow on the present if needed to make it look nice. 3. 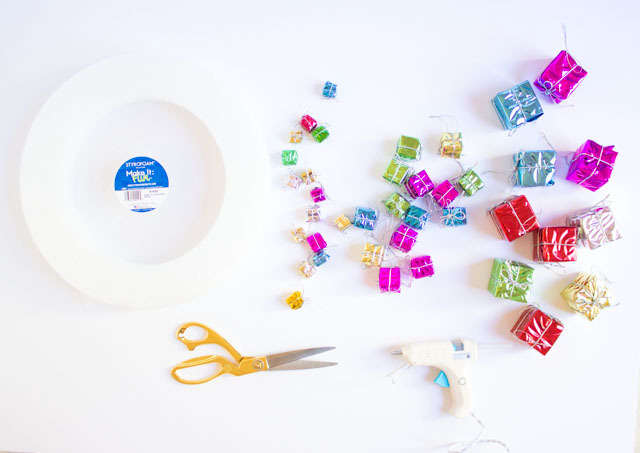 Start with the biggest ornaments first by gluing them around the top of the wreath form. I positioned some upright and some on their sides and varied the colors around the wreath. I placed my ornaments just on the top of the wreath, but if you have a lot of ornaments and want an even fuller wreath you can glue them around the sides as well. 3. 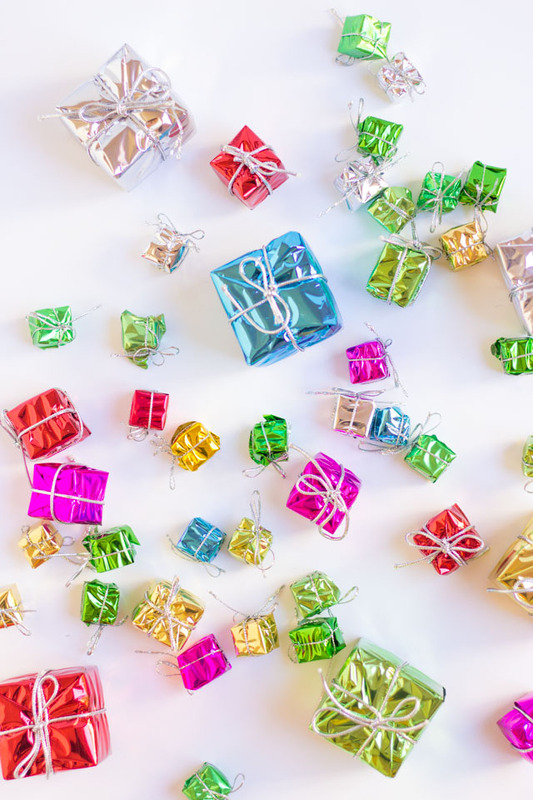 Fill in the gaps between the big presents with the medium and small presents, securing in place with hot glue, and layering some on top of each other until you have the look you want.